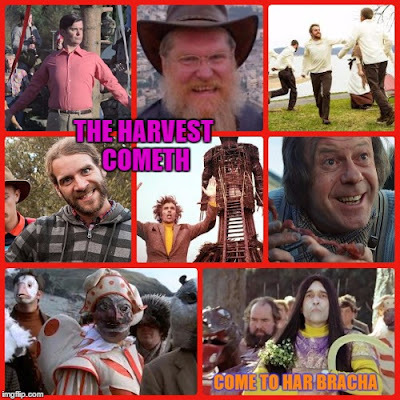 H/T Tomer Devorah for sharing this video: Portrait of "Hayovel" missionaries perverting our sacred Sukkot with pagan mockery, all in the worship of their man-god. A grotesque spectacle of xtian women co-opting the dress and head-coverings of religious Jewish women. Bearded men waving lulavim, flailing them about with fervor, as they sing their songs of praise for idol worship. All under the confines of a Sukkah, nestled in the confines of the closed religious community of Har Bracha. 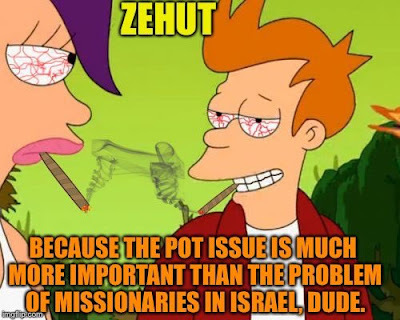 Funny, how the Har Bracha website makes no mention of missionaries dwelling in the yishuv. How many religious Jews in Israel and abroad know what is happening in Har Bracha and the greater Shomron region, as evangelical missionaries plant their roots and work on forming "relationships" with Jews? How many religious rabbis are aware of this sin? How many open their mouths and scream out in outrage? Who would have thought such a thing possible? Daati-Leumi Gone Wild? Or are they just plain mad? Shabbtai Tzvi would have a field day with this unbridled messianic fervor,which has much more in common with xtianity than anything remotely Jewish. 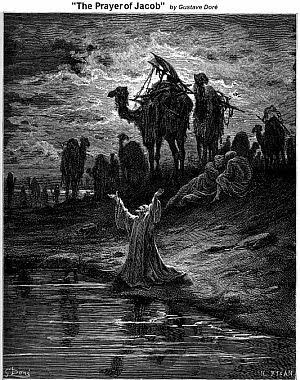 Spitting on G-d's miracles and the miracle of Eretz Yisrael. Brother Esau sure knew what he was doing when he put down his bloody sword and put on his cowboy hat. All he needed were unscrupulous Jews, and a big sack of gelt. And then the enablers of these evangelical asps have the nerve to complain to us about our website featuring a "Wall of Shame"! What would King David and Hezekiah have done with Hayovel, and how would they address those Jews who gave them a foothold in the land? What about Elijah? The early Chashmonaim? What would the Gaonim, Rishonim, and Acharonim say? This is an unprecedented chillul Hashem in Jewish history. Where in our history did religious Jews allow missionaries to set up shop in a Torah community? "They aren't missionaries, our detractors claim." They need to open their damn eyes already. Stop playing games with us. The evidence is overwhelming. 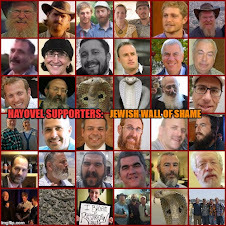 Hayovel are spiritual predators. "Wall of Shame"? Appropriately titled. And to those who have a problem with it, if the shoe fits, hit yourself in the head with it. The Wall of Shame is for those with zero shame. Zehut's new golden-boy Yishai Fleischer recently came on this blog to hurl insults and lies, without addressing the issues we raise. Evidently, he would rather rail against JewishIsrael and others (including us) who call out everyone who has a hand in this sin. Yishai Fleischer seems upset. Perhaps he deemed the #8 slot in the Zehut primaries to be an insult? Perhaps he wants to skate from his associations? Perhaps he is unhappy that there are cracks in Zehut's camp? In any event if Zehut's Moshe Feiglin wants to prove that he cares more about the missionary issue in Israel than the ever pressing issue of cannabis legalization, the public needs to know why a supporter of Hayovel and Mike Huckabee is even in the party. As I always say, it isn't personal, It's just halacha. I am pleased to hear from inside sources that there is discontent in the ranks of Zehut's followers. Some are wondering the very same thing. And many are bothered. It won't go away by itself. And perhaps the Zehut stage will be another vehicle to expose the evil Waller family and their nefarious agenda. 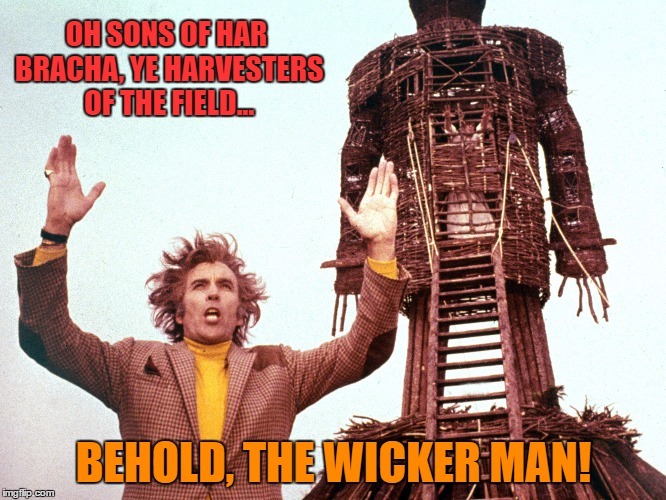 May the names and memories of the Waller family be obliterated.